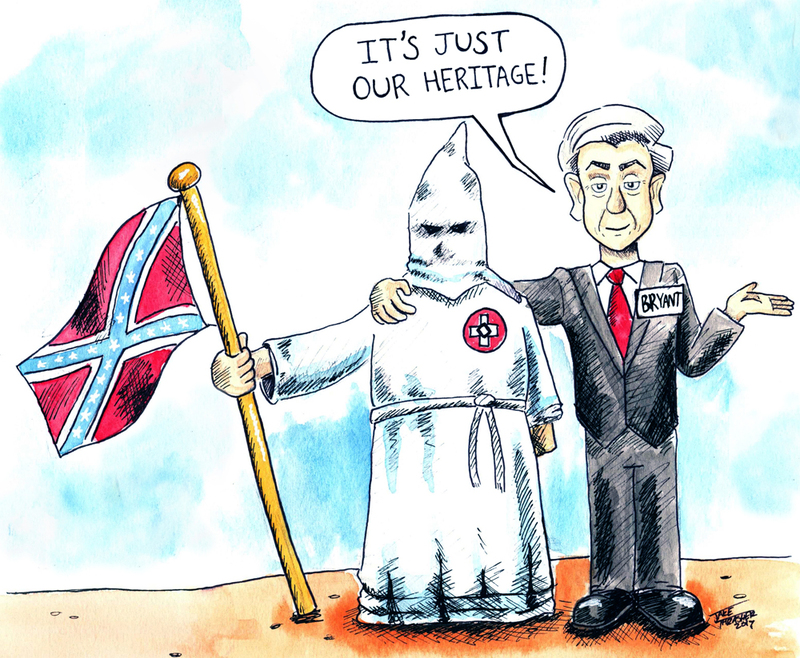 A student cartoonist who draws for the Daily Mississippian at the University of Mississippi, Oxford (Ole Miss) has received numerous death threats because of his cartoons condemning white supremacy and racial hatred. 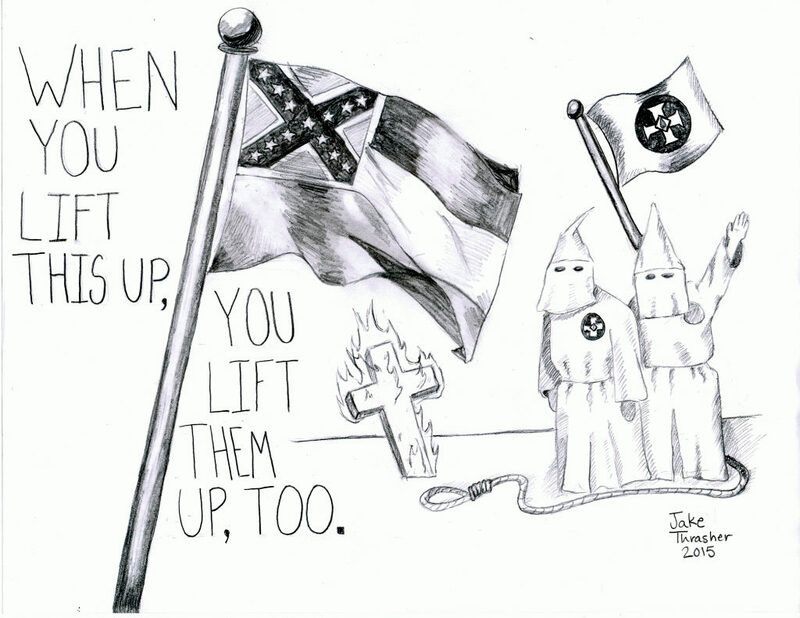 Beginning long before the events in Charlottesville, Jake Thrasher had been waging a battle through his cartoons against the white supremacy elements that seem to be so active on his and many other college campuses. The battle lines on his campus seem to be drawn around the state flag that still displays the Confederate battle flag as part of its design. Jake, after a deluge of highly threatening emails, reports that he has felt physically endangered, abandoned and exposed. It would seem there is a conspiracy of indifference towards these kinds of white supremacist assaults which in some cases amount to tacit approval. He reports that non-student white supremacist groups have easy access to the college campus where they interact with many possibly sympathetic student organizations. Jake is a chemistry major and has won many awards for his cartooning and his journalism work. He is the staff cartoonist on the Daily Mississippian, the student paper at Ole Miss. 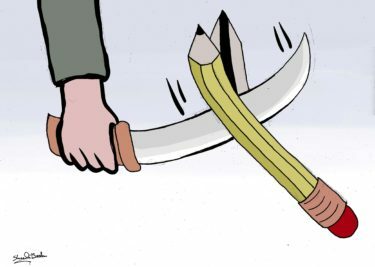 Cartoonists Rights Network International condemns the hate groups that are threatening Mr. Thrasher and we strongly advise that the Chancellor of the University provide protection and support to any students including cartoonist Jake Thrasher who may be receiving death threats from white supremacist organizations or individuals. CRNI in partnership with the National Endowment for Democracy (NED) is sponsoring some incredible workshops in Africa, South Africa and Palestine. These workshops will engage future cartoonists and empower current cartoonists. Palestine works hop leader, Mohammad Sabaaneh, hopes that in conjunction with the Freedom Theater, they will enhance undergraduate’s awareness and knowledge of the importance of cartooning as an indicator for the democracy and freedom of speech. The workshops will take place over a series of weekends in September. Mohammed has been a client of CRNI for about five years. He was imprisoned by the Israeli Defense forces and held incognito for about a year, we advocated for his release with other organizations and he was finally released. 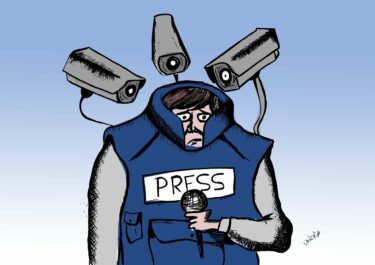 He has published a number of cartoon books of his work, and in 2015 he became one of our regional representatives representing Palestine and the Middle East. He is known as an equal opportunity critic, often being in as much trouble with the Israelis as with Hamas or with the PLO. The Freedom Theatre offers a range of cultural activities, including drama workshops, theater performances, a three-year professional theater school and training in stage management; photography, film making and creative writing. 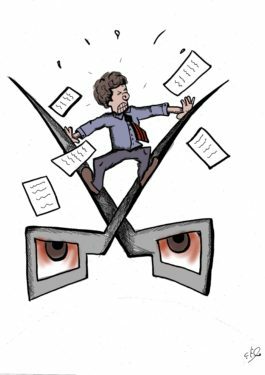 On September 26th, Accra workshop leader, Ike Essilfie-Essel, is bringing awareness to the global violation of human rights and equipping cartoonists with the knowledge and tools to maintain their safety. Ike Essel, is an old friend with CRNI. More than a decade ago, Ike helped organize the very first meeting of all the major and minor cartoonists in Ghana. Sponsored by Cartoonists Rights Network, the workshop brought together the young, upcoming cartoonists with their cartoonist heroes. The chance for them to meet with each other for the first time was a life-changing experience for most of them. 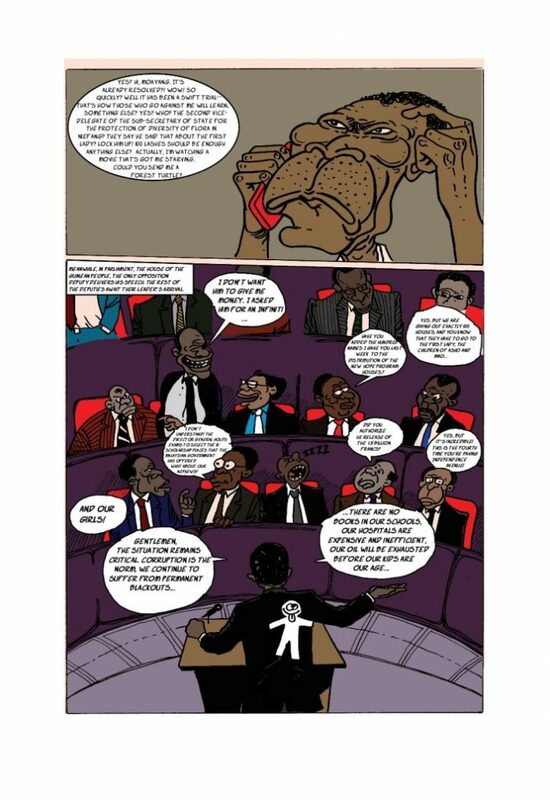 Because of the meeting they could all put faces to the cartoons that they adored and saw every day and suddenly a new network of cartoonists was pulled together, Cartoonists Ghana. 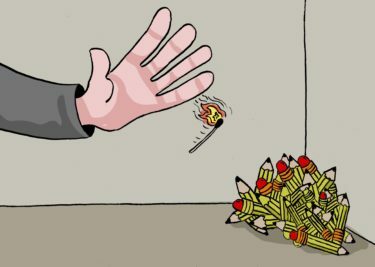 On September 9th & 10th, Cape Town workshop leader John Curtis, will host a panel discussion and workshop for South African editorial cartoonists, who face increasing threats to their freedom of expression, impacting their ability to hold powerful individuals accountable, implement social justice and uphold democratic principles. Curtis is hosting this workshop in conjunction with Cape Town’s annual Open Book Festival’s Comic Fest . Curtis is an award winning editorial cartoonist, who founded Africartoons nine years ago, on Nelson Mandela’s 90th birthday. 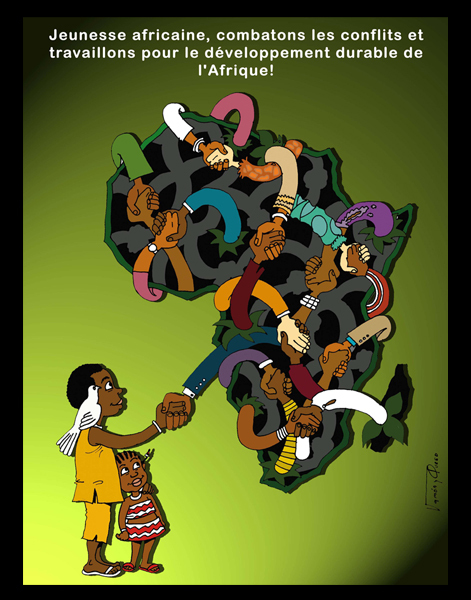 Africartoons hosts a network of professional and amateur cartoonists, the largest online archive of African editorial cartoons (25,000+) and 720,000 Facebook followers. A huge thank you to the National Endowment for Democracy for partnering with CRNI on this endeavor as it implements our strategy to help young emerging cartooning organizations develop themselves administratively and conceptually.